A Lie Universally Hidden was one of the best books I’ve read this year, so it was with great joy that I heard that Anngela Schroeder was releasing a new book called The Goodness of Men. I am currently reading it and it does not appear to be at all similar to her previous JAFF endeavour, which is always a good sign because I love diversity! And that is precisely the word of order today. We wanted to present to you on this post something different than usual, so instead of bringing Darcy or Elizabeth for an interview, we decided to talk to the wildest of the Bennet sisters, Lydia. Miss Lydia, thank you for joining us today. What? Oh, yes. You are welcome. I understand you have a trip to Brighton coming up. What are you most excited about? I am so pleased to seek out adventure while my sisters cannot. I will be surrounded by officers, and attend balls and plays. I will be the most desired partner on the dance floor. And me only fifteen! Why do you love a man in the militia? Is it because of their duty to the country? Duty to the country? I guess I never thought of it that way. No, I have not. I like a man in the militia because their uniforms make them look so smart. What is your relationship like with your sisters? Harriet Forester? My sisters are all envious of me, especially Kitty and Mary. I am the prettiest besides Jane, but she is still unmarried at three and twenty… or is she two and twenty? Never mind, but I am the one who all the officers pay the most attention to. Harriet Forester is my most particular friend. She and I are so similar. She is what I hope to be- young and beautiful and married to some dashing fellow. But, my sights are higher than an officer or regular Colonel. Where do your sights lay? I will be married to a man who not only wears the colors of an officer or Colonel, but also has money and possibly a title. What is your opinion of Mr. Wickham? Mr. Wickham is a good sort of man for fun, but not someone I would want to marry. He has no title; no estate. My mother has told me I deserve that, and she is never wrong. What is your opinion of Mr. Darcy? I have no opinion of Mr. Darcy, because then I would have to think about him. (Peals of laughter break forth). He is handsome and rich to be sure, but who would want to marry such a droll man? It would be the same as marrying my cousin Collins! If I had to choose one, I would say Jane, because she is quiet and leaves me alone. What type of relationship do you have with your parents? What does that mean? Relationship with my parents? My father is my father. He gives me pocket money and I live in his home. My mother does whatever makes me happy. Your sisters are always telling you to behave. How do you feel about that? Lizzy and Mary hold themselves to highly above others. They think everyone should behave like they do, and I think that is so boring! I cannot wait to marry and leave Longbourn. Ten years? La, I don’t know! Somewhere having fun, I guess! Anngela Schroeder lives in California with her husband of 16 years and her three rambunctious sons. She has a degree in English with a concentration in British Literature and a Masters of Education. She has a mild obsession with Jane Austen, and enjoys traveling, baking and making her family’s world a magical place. She is the author of: A Lie Universally Hidden, Affections and Wishes: A Matter of Chance, The Quest for Camelot, The Goodness of Men and contributor to the anthology Then Comes Winter. 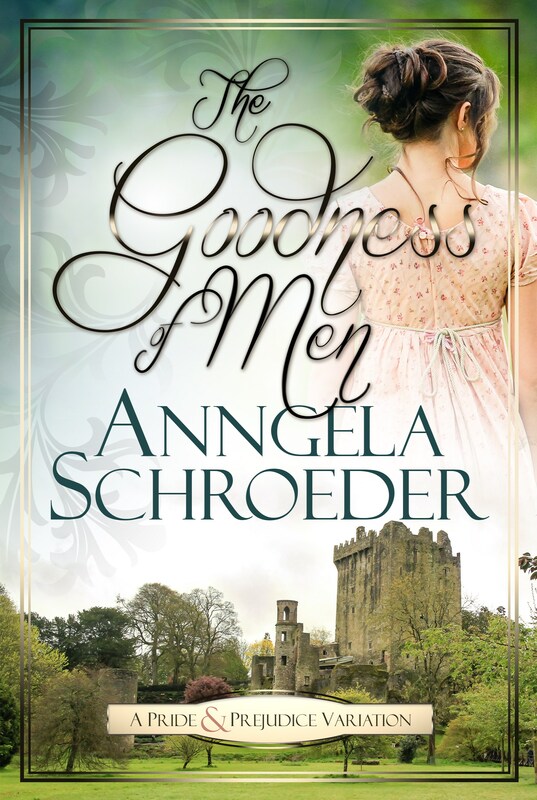 Anngela Schroeder is offering 2 kindle copies (international) and a signed hard copy (USA only) of The Goodness of Men. To enter the giveaway all you have to do is comment this post and click here. So Lydia claims she isn’t interested in marrying Wickham… does she change her mind, or is she just pretending? And Good Luck with the book! I would be thrilled to win an autographed copy. Thank you for the opportunity. Sounds like a good story–thanks for the fun interview and giveaway, too! Oh my this sounds interesting. Is Lydia stretching the truth about Wickham? Who is the stranger and how does he help Elizabeth see the true Darcy? Thanks for the giveaway Anngela. La! What a joke! Glad Miss Lydia aims higher than Wickham but am wondering what actually does happen with her in Brighton! Looking forward to reading this! Thank you for a chance at the giveaway! Did I see Lydia Bennet-Candy??? Is that a last name? I love the cover and can’t wait to read this. Good luck to everyone on the give-a-way. Thanks to our author for the generous give-a-way. Blessings on the launch. Thanks to Rita for hosting this post. I loved ‘a lie universally hidden’ and can’t wait to read this one! What could be in Darcy’s past that could change Elizabeth’s opinion of him? Whose Estate does he see her at if not his own? Hmm I’ll have to read to find out. Thanks! This cover is everything! I can’t wait!!! Haha! Lydia always makes me laugh! One rarely reads an interview with Lydia Bennet, and she is exactly what one expected. I especially liked her comments regarding Jane and her parents. I, too, liked A Lie Universally Hidden. Thank you for the giveaway. My goodness,who is this Lydia and from where did she get such lofty aspirations?? She no longer has her sights set on Wickham,wishing a parallel existence with her particular friend,Harriet and wishes to align herself with a decorated high ranking officer!!! Wow!!! I hope her wishes are fulfilled although I would have thought being married to a man many years her senior,as Harriet is,would quickly serve to quench her vitality and youthful exuberance! Who knows where she may find happiness? Hope this book is well received,Angela. Cheers Rita for such a lovely post! that avenue is closed to me. I guess it wasn’t meant to be! Thanks for the lovely post! Hope to be able to read this book soon! Lydia never thinks about what she says nor does she even pay attention to when she contradicts herself so take with a grain of salt anything that proceeds out of her mouth. Thanks for sharing.